(Nanowerk Spotlight) Oncogenes are genes that are associated with the development of cancer – when mutated or expressed at high levels, they can help turn a normal cell into a tumor cell. Promising new chemotherapeutic strategies have therefore focused on suppressing oncogenes. One such approach is based on RNA interference (RNAi), a technique wherein small double-stranded RNA molecules can sequence-specifically inhibit the expression of targeted oncogenes. The idea here is that with the help of small interfering RNA (siRNA), key oncogenes that modulate signaling pathways and thereby regulate the behavior of malignant tumor cells can be manipulated. "To harness the full potential of this approach, the prime requirements are to deliver the siRNA molecules with high selectivity and efficiency into tumor cells and to monitor both siRNA delivery and the resulting knockdown effects at the single-cell level," KiBum Lee explains to Nanowerk. "Although several approaches such as polymer- and nanomaterial-based methods have been attempted, limited success has been achieved for delivering siRNA into the target tumor cells." Lee, an assistant professor in the Department of Chemistry & Chemical Biology at Rutgers University, says that most of the studies comprising the use of nanomaterials for siRNA delivery have focused on the knockdown of non-oncogenes (e.g. genes coding for green fluorescent protein). There is a lack of studies which focus on specifically targeting the knockdown of oncogenes, which would significantly contribute towards cancer chemotherapy. "To narrow the gap between current nanomaterial-based siRNA delivery and chemotherapy, there is a clear need to develop methods for target-oriented delivery of siRNA, for further monitoring the effects of siRNA-mediated target-gene silencing by means of molecular imaging probes, and for investigating the corresponding up/down-regulation of signaling cascades" says Lee. The researchers' goal was to use the RNAi-based approach to specifically inhibit the PI3K/Akt signaling pathway – a key signal cascade for cancer cell proliferation and apoptosis – in brain tumor cells, which were surrounded by non-malignant cells, thus demonstrating the target specificity of a class of siRNA quantum dots (siRNA-QDs) that they developed. 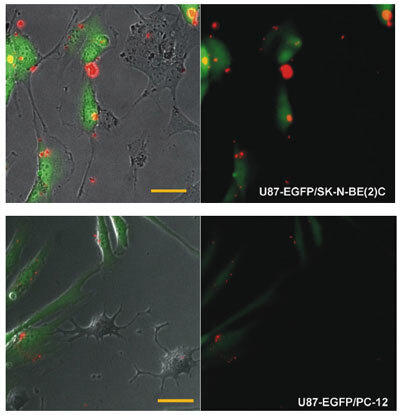 In new work published by Lee's team and collaborators at UCLA ("Selective Inhibition of Human Brain Tumor Cells through Multifunctional Quantum-Dot-Based siRNA Delivery"), the researchers first optimized their system by knocking down the expression of enhanced green fluorescent proteins (EGFP), and then using this optimized system they successfully suppressed the expression of EGFRvIII (epidermal growth factor receptor variant III) in the human GBM cell line, which subsequently led to cell apoptosis. "The research carried out in our lab is truly interdisciplinary" Lee points out. "We wanted to make use of our expertise in chemical synthesis, material science, and biomedical science to develop a platform for specifically targeting invasive, malignant and difficult-to-treat tumors such as human glioblastomas to contribute towards developing novel and multimodal delivery systems." The knockdown of the mutant EGFR receptor (known as EGFRvIII) using RNAi has previously shown to inhibit tumor cell proliferation and subsequently result in apoptosis through the inhibition of the PI3K/Akt signaling pathway. "Our method using siRNA-QDs against EGFRvIII enabled us to not only efficiently deliver the drugs specifically into tumor cells, but also track their delivery" says Lee. "The biggest advantage of using siRNA-QDs, besides imaging, is that we can modify their surfaces with ease to attach a variety of biomolecules (e.g. targeting peptides, homing peptides, and siRNA molecules) on the same nanoparticle." The siRNA-QDs have been designed in a manner that allows the attachment of a variety of biomoles on the surface of the QDs. These nanoparticles can be potentially used for targeting a variety of cancers by simply changing the targeting moieties and the siRNA. This system can potentially be used in vivo to target malignant tumors, and track the localization of the quantum dots within the tumor. One concern that needs to be addressed in further studies is the potential toxicity of the quantum dots if this siRNA-QD technique would be used in vivo to target brain tumors. "Although the quantum dots did not show cytotoxicity in vitro, we will be addressing the toxicity concerns by developing quantum dots with less cytotoxic materials and absorb in the near infrared region which would significantly help us to track the delivery of biomolecules in vivo" says Lee. "Concurrently we are developing other types of nanomaterials in the lab which are not known to be cytotoxic and can perform similar functions as demonstrated by the quantum dots in this work." The team notes that, while the ability to functionalize as well as control the surface of quantum dots with specific linkers and multifunctional molecules (siRNA and peptides) is critical for nanoparticle-based drug delivery, this method could also provide highly useful information regarding biological surface chemistry of nanomaterials. The scientists plan to further develop this system by including anticancer drugs on the surface of nanoparticles along with the siRNA molecules. "We hypothesize that the potency and specificity of our system would increase many fold" says Lee. "Another direction that we are currently working on is using this system to knockdown signaling pathways within adult stem cells (e.g. neural stem cells, and mesenchymal stem cells) to control and modulate their behaviors such as proliferation, differentiation, growth and adhesion. Using non-viral siRNA delivery/tracking systems within stem cells will be big step towards developing improved strategies for regenerative medicine."